My birthday, Boston Brunchers’ birthday, work events, blah, blah, blah. The days are getting shorter, the sun isn’t showing its head until about 7am, and it is just plain cold. Basically, I am making excuses for not working out this past month, and not eating “optimally”. But, with this past weekend behind me, I know that I am ready for a detox. I just need to get back on the right foot. Now, I’m not going to lie. 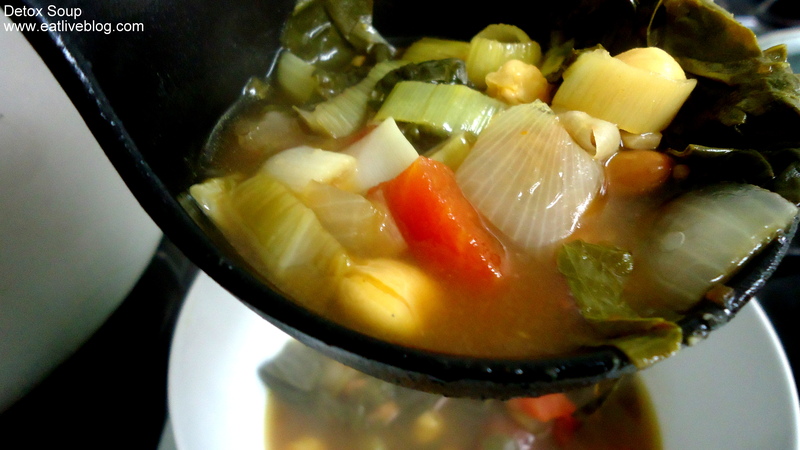 I have been a victim of the Cabbage Soup diet in the past. Stop laughing. I am not doing that this time. Since entering the food blogging world, I have learned a lot about food and my body. So this time, I am doing a simpler, cleaner week-long plan. Basically I am going to TRY to eat only fruits, vegetables and whole grains. This means that I am eliminating bread, meat, caffeine and sugar from my diet for the week. I will keep you posted on how it goes. If I can get past my birthday lunch with my co-workers at 5 Napkin Burger staying in line, then I think I will be set for the week! 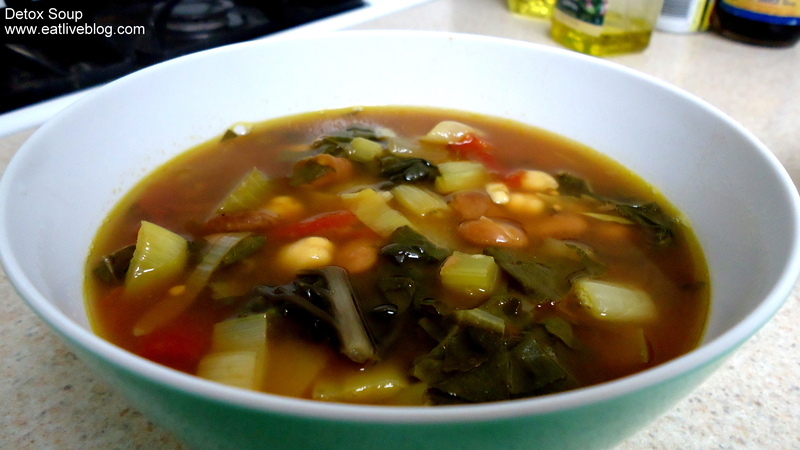 To kick off my detox week, I made, what I am calling “Detox Soup”, it is loaded with veggies and not much else. I did use More Than Gourmet Roasted Chicken Stock as the base of my soup. I know that I should have used veggie stock, but when prepared, this stock was really nice and subtle with a beautiful brown color. Plus, it is all natural and there is nothing, at all, added to it, so I thought this was an acceptable addition. The nice thing about More Than Gourmet is that it is REAL stocks and sauces, reduced down to make it easy for you to use! Storage is easy, and the result is a delicious, all natural flavor to your meal. The soup came out beautifully and made me fall in love with leeks all over again! Their flavor really stole the show. 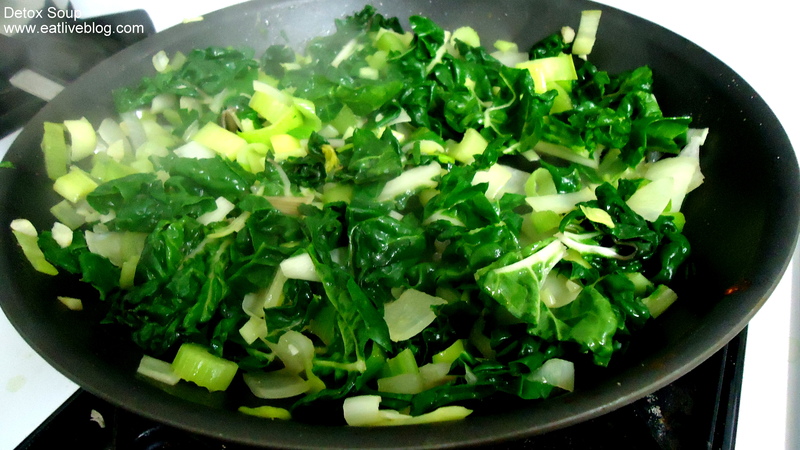 And I was equally impressed with the Swiss Chard, since this was the first time I had cooked with it. It takes on a taste very similar to spinach without getting overly “wilty”. So, wish me luck! And please feel free to share any detox tips you may have! 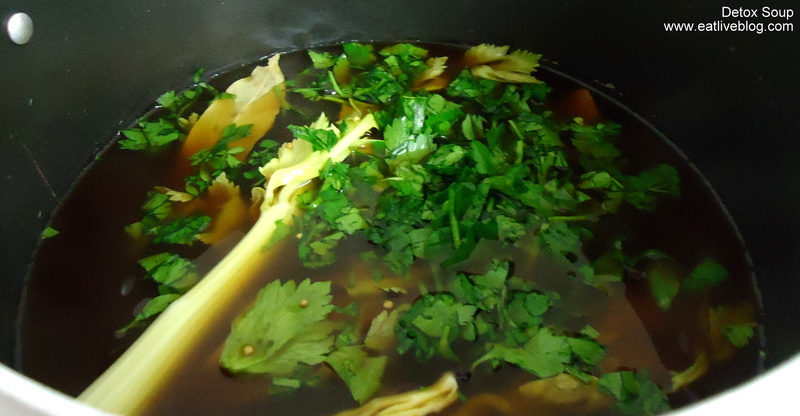 In a large stock pot, bring stock to a simmer. Place peppercorns, mustard seed and bay leaves in a tea bag or tie in a cheese cloth. (if you don’t have either of these, just plan to fish out the peppercorns and bay leaves before serving. 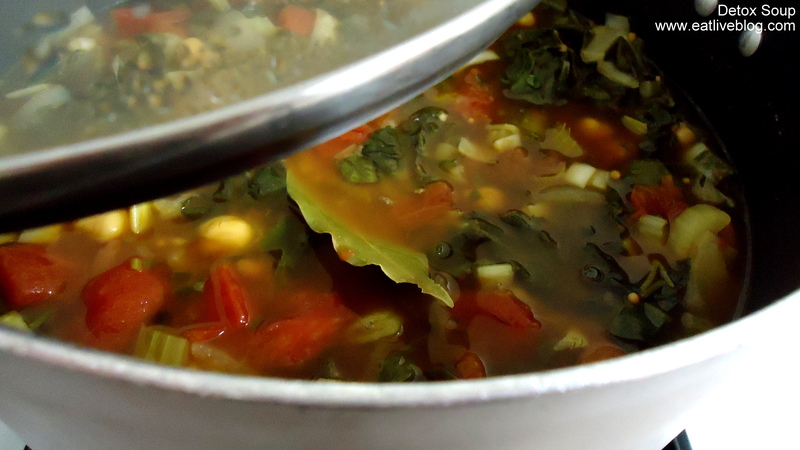 Allow to continue simmering while you prepare the veggies. In a large saute pan, pour in the olive oil and garlic. Turn the heat on to medium-high. Disclaimer: More than Gourmet did provide me with samples of their product. But as always, the opinions in this post are my own. 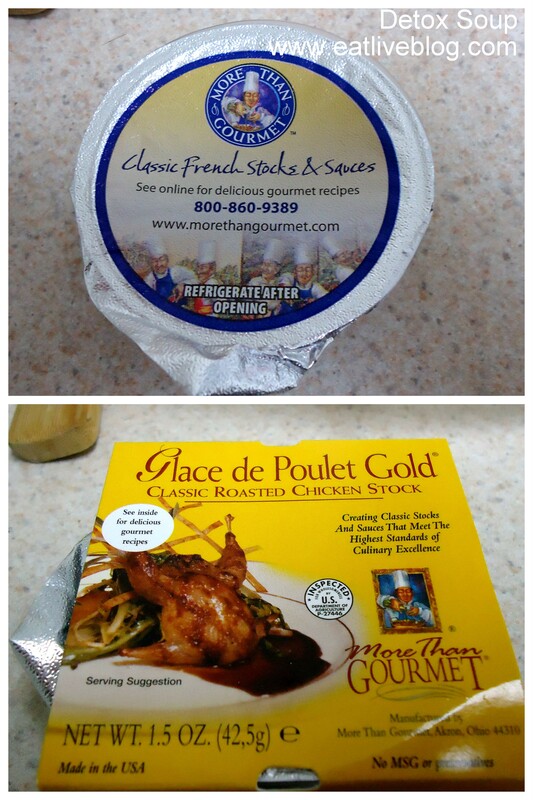 This entry was posted in Recipes and tagged chicken stock, detox, diet, dinner, main course, more than gormet, recipe, soup, vegetables by reneeh. Bookmark the permalink. yum! 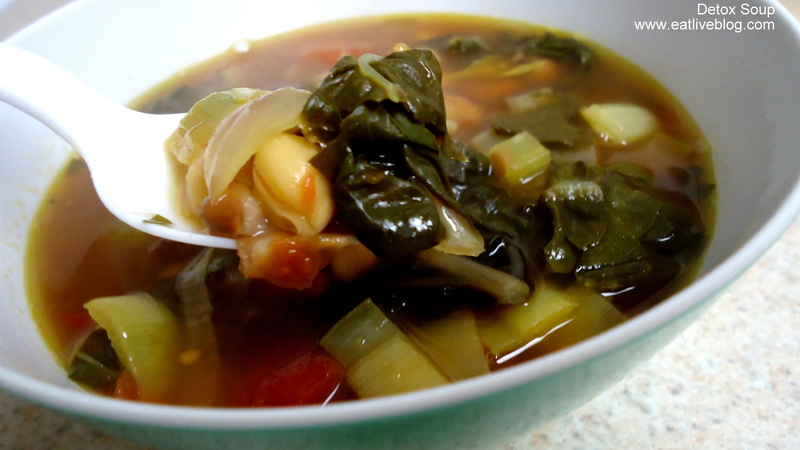 Soups are definitely great detox options this time of year because they’re still warm and filling! I also like to roast a ton of veggies when I need to “cut back” because it doesn’t feel like punishment! 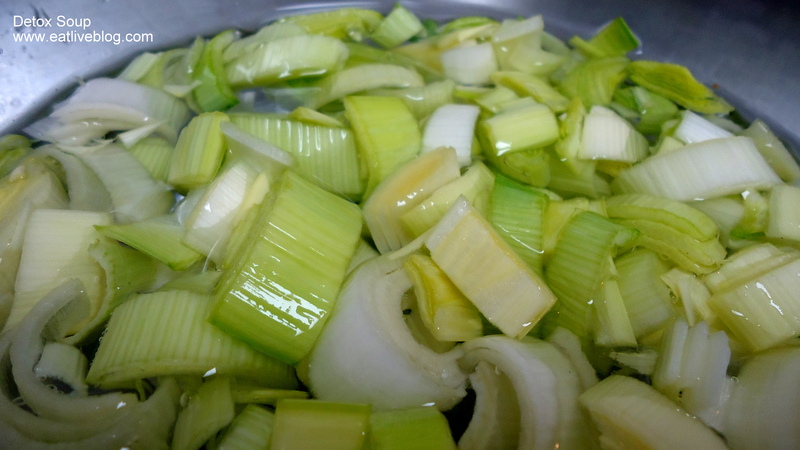 The soup looks great and very fresh – I need to use leeks more often! I have a general suggestion: if you want to mix it up a bit, look through some raw cookbooks and find a few recipes to incorporate. I’ve found awesome ‘puddings’, ‘milks’, and ‘creamy’ salad dressings that are entirely vegan and raw. Almonds, dates, and avocado go a long way when you’re focusing on simple eating. Thanks Liz! That is a great idea! Do you have any raw cookbooks or blogs that you especially like? ‘Ani’s Raw Food Kitchen’ by Ani Phyo was my first introduction to raw food. There are a lot of great basics in this book, but everything from her is a safe bet. ‘The Raw Food Revolution Diet’ was also good for the background info on why people eat raw and how to do it in a balanced way, plus there are some good recipes. Only eating raw is definitely not sustainable for me, but this past summer I did a raw detox (with the exception of continuing to put some plain Greek yogurt in my morning smoothie…) for 4 or 5 days and I felt amazing. I guess my best detox tip is to make sure you still eat enough – sometimes when you restrict your options finding something to eat takes too much effort, but letting yourself get really hungry will make it really hard to keep going. I need to do the same as well. I’ve taken in so much sugar in the past couple weeks, I’ve been walking around with a constant headache. I love sweets of all sorts and bread. Just this morning I told myself this is it. Now to swear off sweets and breads. I’ll drop the pounds for sure plus exercise of course. By Christmas I’ll be able to get into a bathing suit and look somewhat presentable – at least I hope so! Good luck on your detox! 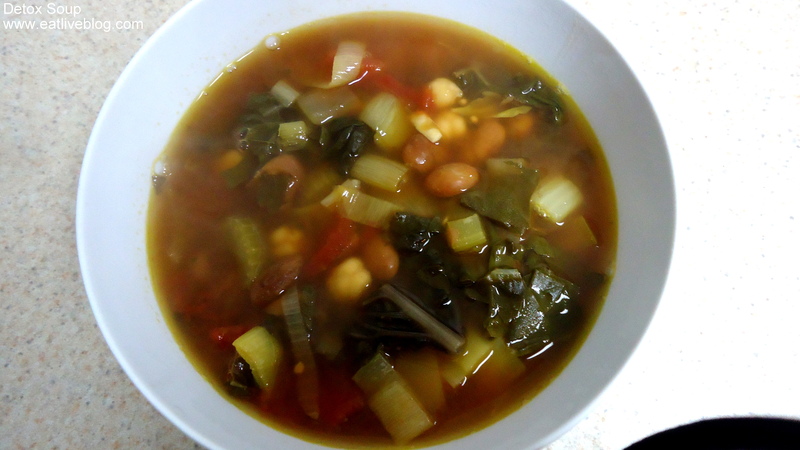 This soup sounds wonderful for a weekday lunch, detox or not. Good luck with your detox. Renee, thank you for your kind words about our sauces. We appreciate your willingness to give them a try.